Written in pencil is "My Richard" and "Friday, June 5, 1931." The article details the suicide of a young man who feared that "poor eyesight would bar him from the Military Academy at West Point." 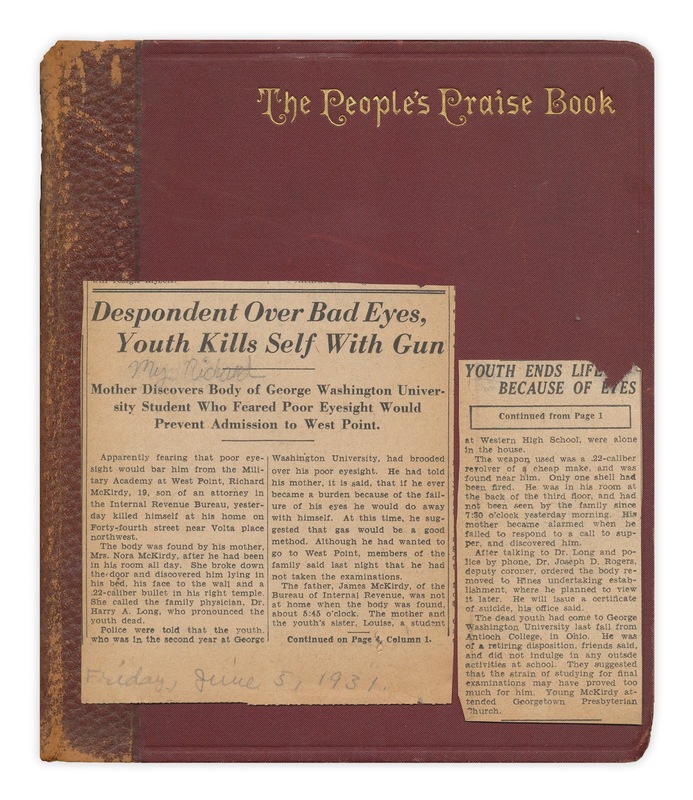 Found pasted in "The People's Praise Book" edited by Henry Sanders and George C. Lorimer. Published by A.S. Barnes and Co., 1889. What a sad story! I hope this praise book gave the person some comfort. Do we imagine it's his mother? The writing seems like the had of a youth. Perhaps a girlfriend? He must have been in dire straights to take his life. I feel badly. I am not so sure it was because of the stress of finals. If his eyesight was failing, I can understand his distress at loosing his sight and way of life. Relying on others for help is very difficult, I know. I hope he found the peace he wanted. RIP.